Bigger than breakfast and more leisurely than lunch, brunch is one of the most popular and arguably the most important meal of the weekend in Hong Kong. We’ve enjoyed our fair share, from the city’s highest to the most comforting of them all, to give you five Prestige-approved brunches to try. Brunch at the Catalan-inspired restaurant promises to take guests on a journey through the markets of Barcelona and it doesn’t disappoint. The bright space overlooking the harbour offers fresh ensalades, Iberico ham, cheeses and San Sebastián-style pastries from the “Pintxos bar”. With continuous orders of tapas, you’ll need to make a conscious decision to leave room for the mains including Segovian-style suckling pig, salt crusted fish, Josper grilled Tomahawk steak and generous servings of squid ink paella. If you make it to the dessert table, you must try the salted caramel mousse cake and wash it all down with free-flow sangria for a satisfying Mediterranean-infused weekend. Classic Italian fare is comfort food at its best and after a long week at work, it really is the most uplifting answer. Enter Mercato with a new semi-buffet option that has unlimited antipasti and freshly shucked Fine de Claire oysters, as well as a choice of one appetiser and main dish. 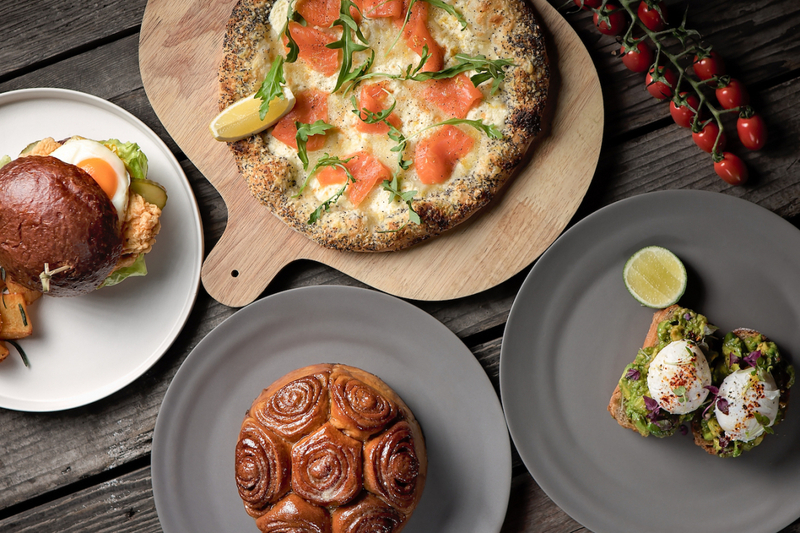 Favourites including the house-made ricotta with strawberry and black truffle, three cheese and farm egg pizza, are great for sharing (or not). A big cheers to the weekend is offered with two hours of free-flow Champagne Mumm, but there is more than enough to sample including zesty Sicilian margaritas, bloody marys, wines and more. The much-loved British tradition of Sunday roast is veritably alive at the Mandarin Grill + Bar. It begins with steak tartare, grilled scallops and chilled oysters, which primes you for the egg course that you can choose in benedict, florentine or royale style. There are also appetiser options in which the lobster bisque with tarragon cream is a standout dish. The main attraction will arrive table-side on a trolley and slow-roasted USDA prime rib of beef is carved to enjoy with crispy Yorkshire puddings baked to perfection; making brunch at this one-Michelin-star restaurant — offered with impeccable fine-dining service — a Sunday well spent. Take a trip to Japan, by way of Fumi in the California Tower, without the plane ticket. There is even a Japanese zen garden on the balcony to make you feel like you’ve left Hong Kong. Offering unlimited made-to-order sushi and grilled skewers made with fresh seasonal ingredients flown in from Japan on a daily basis, it certainly fixes that undeniable craving. There are also premium add-ons to choose from including chu-toro (a medium-fatty cut of tuna) nigiri and the grilled Miyazaki beef sirloin for the meat-lovers on the table. Opt for Japanese house sake, Asahi beer and Suntory premium malt whisky to complete the full experience. Taking us all to another level, the 118th floor of the ICC to be exact, Ozone offers the Ultimate Brunch with Dom Pérignon. Although not a new brunch, it most certainly is a favourite for first-time Hong Kong visitors. The international buffet includes a whole host of appetisers, savouries and a dessert spread made by the hotel’s pastry team. Featuring a menu that rotates on a regular basis, the brunch now includes lobster paella, Spanish cold cuts, fresh seafood and more. All this and fantastic service at an altitude of 480 metres, it is a top choice for that special occasion.